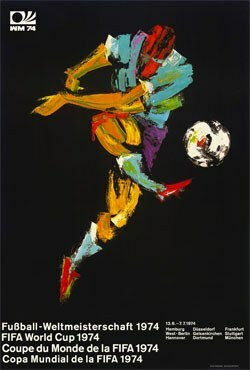 The tenth World Cup was played in West Germany between 13 June and 7 July. The qualifications for the final tournament included 98 national teams. For the final tournament 16 teams would be contending the title as world champions. Australia, East Germany, Haiti and Zaire participated for the first time. As the host nation, West Germany was automatically qualified and so was Brazil as the title holder. Security would be high on the agenda since the horrific Munich massacre two years earlier in the Summer Olympics when terrorists killing eleventh athletics. All matches and accommodations of the teams were highly guarded. For the World Cup in 1974 a new trophy was introduced (Brazil had won the Jules Rimet Trophy permanently due to three victories). The new trophy was just called FIFA World Cup Trophy. It was created by Silvio Gazzaniga and made of 18 karat gold and the green ring lawyers on the lower part was made of malachite. Apart from the previous trophy the ruling for the new trophy prevent any nation from winning it permanently. The format was made out by two group phases, with eight teams advancing to the second phase, followed by a match of third place and a final. No Quarter – or Semi-finals was played. The 1974 World Cup was played at nine stadiums, in nine cities. The 1974 version of Brazil was not a worthy follow up to the brilliant team that won in 1970. Its players showed more brutality than characteristic samba skills against Holland in the second group phase. The bleak performance could partly be explained from the fact that Pelé had retired and Gérson, in addition to some other key players, was injured. A team that still treated football as an art form was instead the Netherlands. According to many the best team in the tournament, Netherlands led by Johan Cruyff won five times and draw once until the final. Netherlands that hadn't been in a World Cup final tournament since 1938 practiced a tactic game style what has been known as total football and was originally initiated by AFC Ajax. Their opponent in the final, West Germany, had been favorites for the title before the tournament thanks to their victory in the European Championship two years earlier (their coach was Helmut Schön, that had been the assistant to Sepp Herberger when West Germany became world champions in 1954). But West Germany's path to the final wasn't as smooth as the Netherlands and the very special meeting with East Germany would in fact end with a loss. The final between West Germany and Netherlands. The final got a chocking start. 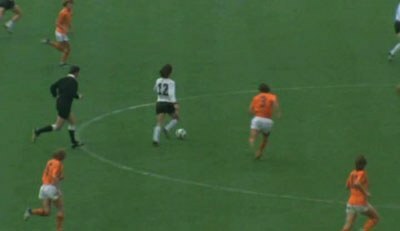 Before they had touched the ball once, the Germans could only stop the advance from Cruyff with a tackle in the penalty area. The penalty would result in 1-0 to the Netherlands, but neither this time would Netherlands earn the World Cup title. FIFA World Cup 1974 would include 38 matches in which 97 goals were scored (2.55 per match). Five red cards and 83 yellow cards were shown during the tournament. From the first group phase (including four groups with four teams in each) these eight teams advanced: East Germany, West Germany, Yugoslavia, Brazil, Netherlands, Sweden, Poland, Argentina, Netherlands and Brazil. From the second group phase (included two groups with four teams in each) these teams advanced: Netherlands, Brazil, West Germany and Poland. Poland would when win the match for third place against Brazil. In the final the home nation West Germany would face Netherlands. West Germany would in the end win by 2-1. 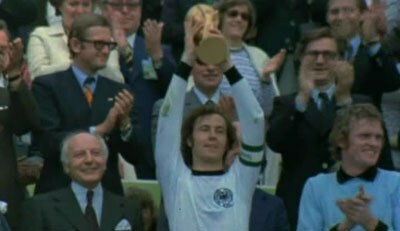 The captain of West Germany, Franz Beckenbauer, lifting the trophy.